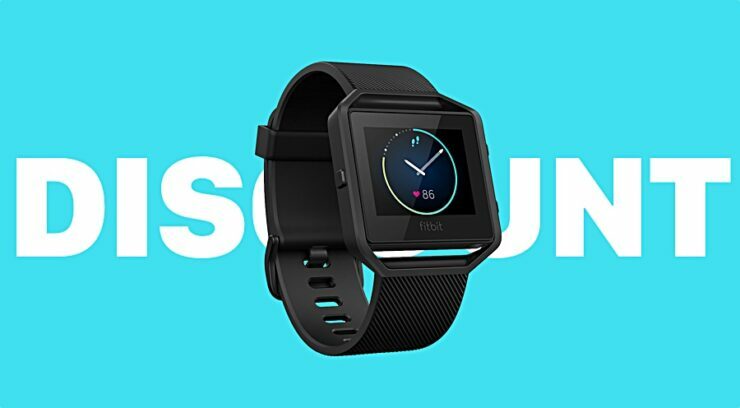 You don’t have to spend a ton of money on a fitness tracker, thanks to a massive Fitbit sale in which you can save up to $50 on select wearables. Grab a Alta HR, Alta, Charge 2 or Blaze and Save Up to $50. So Who’s Up for Getting Fit? Certain fitness trackers (especially the one from Apple) command a premium price tag, making them not affordable enough for the masses. Luckily, Fitbit has a massive sale going on over at Amazon, in which you can pick up one of its high-end fitness trackers and save up to $50. Now that discount might not sound too great, but if you factor in the fact that Fitbit devices don’t cost that much in the first place, then things get exciting all of a sudden. Fitbit Alta Fitness Tracker in Silver/Blue, Large – Regular price $129.95, Now just $99.95. Fitbit Charge 2 Heart Rate + Fitness Band in Plum, Large – Regular price $149.95, Now just $128. Fitbit Charge 2 Heart Rate + Fitness Band in Plum, Small – Regular price $149.95, Now just $128. Fitbit Blaze Special Edition in Gold/Pink, Large – Regular price $229.95, Now just $179.95. Fitbit Charge 2 Heart Rate + Fitness Band in Black, Large – Regular price $149.95, Now just $128. Fitbit Alta HR Special Edition Black Gunmental, Large – Regular price $179.95, Now just $149. Fitbit Charge 2 Heart Rate + Fitness Band Special Edition in Gunmetal, Large – Regular price $179.95, Now just $149.95. Fitbit Alta HR in Fuchsia, Large – Regular price $149.95, Now just $129. Fitbit Charge 2 Heart Rate + Fitness Band in Blue, Small – Regular price $149.95, Now just $129. Fitbit Alta HR in Coral, Large – Regular price $149.95, Now just $129. Fitbit Alta Fitness Tracker in Silver/Black, Large – Regular price $129.95, Now just $99. Fitbit Alta Fitness Tracker in Silver/Teal, Large – Regular price $129.95, Now just $99.95. Fitbit Alta HR in Blue/Gray, Large – Regular price $149.95, Now just $129. Fitbit Altra HR in Blue/Gray, Small – Regular price $149.95, Now just $129. Fitbit Alta Fitness Tracker in Silver/Black, Small – Regular price $129.95, Now just $99. Fitbit Alta Fitness Tracker in Silver/Teal, Small – Regular price $129.95, Now just $99.95. Fitbit Blaze Special Edition in Gunmetal, Small – Regular price $229.95, Now just $179.95. Fitbit Alta HR Special Edition in Black Gunmetal, Small – Regular price $179.95, Now just $149.95. Fitbit Charge 2 Heart Rate + Fitness Band in Blue, Large – Regular price $149.95, Now just $129. Fitbit Alta HR in Black, Small – Regular price $149.95, Now just $129. Fitbit Blaze Special Edition in Gold/Pink, Small – Regular price $229.95, Now just $179.95. Fitbit Alta HR in Fuchsia, Small – Regular price $149.95, Now just $129.95. Fitbit Alta HR in Black, Large – Regular price $149.95, Now just $129. Fitbit Charge 2 Heart Rate + Fitness Band Special Edition in Gunmetal, Small – Regular price $179.95, Now just $149.95. Fitbit Alta Fitness Tracker in Silver/Plum, Small – Regular price $129.95, Now just $99. Fitbit Alta Fitness Tracker in Silver/Plum, Large – Regular price $129.95, Now just $99. Fitbit Alta Fitness Tracker Special Edition in Gold/Black, Large – Regular price $149.95, Now just $119.95. Fitbit Charge 2 Heart Rate + Fitness Band in Teal, Large – Regular price $149.95, Now just $129. Fitbit Alta Fitness Tracker in Silver/Blue, Small – Regular price $129.95, Now just $99.95. Fitbit Blaze Special Edition in Gunmetal, Large – Regular price $229.95, Now just $179.95. Fitbit Charge 2 Heart Rate + Fitness Band Special Edition in Lavender/Rose Gold, Large – Regular price $179.95, Now just $149.95. Fitbit Blaze in Black/Silver, Small – Regular price $199.95, Now just $149. Fitbit Charge 2 Heart Rate + Fitness Band in Teal, Small – Regular price $149.95, Now just $129. Fitbit Blaze in Black/Silver, Large – Regular price $199.95, Now just $148. Fitbit Alta HR Special Edition in Pink/Rose Gold, Large – Regular price $179.95, Now just $149.95. Fitbit Charge 2 Heart Rate + Fitness Band in Black, Small – Regular price $149.95, Now just $128. Fitbit Charge 2 Heart Rate + Fitness Band Special Edition in Lavender/Rose Gold, Small – Regular price $179.95, Now just $149.95. Fitbit Alta HR in Black, X-Large – Regular price $149.95, Now just $129.95. Fitbit Alta HR Special edition in Pink/Rose Gold, Small – Regular price $179.95, Now just $149.95.